Second, nothing lasts forever. The dynasty will end. We’ll let you know when we’re done. Ya it seems as if the cheating will continue. Well as long as Goodell is the commissioner. Loyalty, a lot of empty seats at the last couple of donkey home games. I guess u donkey fans are only loyal to a point. Well I hope u come down because we need ticket takers at the gates for the 6 time super bowl champions. No one said anything about the fans for the Red Sox, Bruins and Celtics they are loyal and have been forever. I was talking about the Pats BANDWAGON fans like yourself. I will get my tickets, usually when I do have time to go a Pats game with some friends they lose. You have nothing to say about the team, so you now attack the fanbase. First, you'll never be as loud as the Broncos in your home stadium. Second, nothing lasts forever. The dynasty will end. Third, you are not the Steelers fanbase. They travel much better than your bandwagon fans. All these things that Pats fans do they only do when they win. When the dynasty is over the Pats fan base will be over the Bandwagon fans will run and hide under a rock just like they use to. 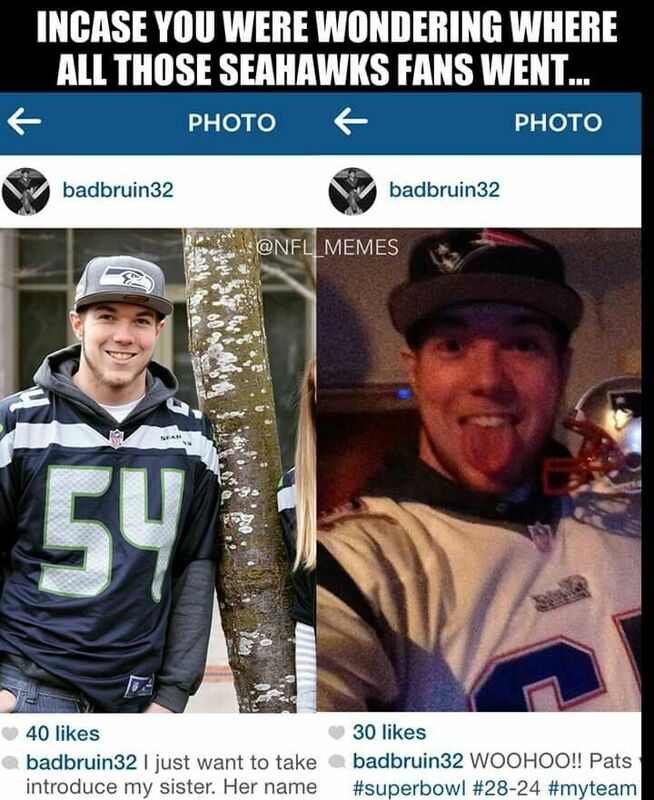 The Pats fan base have always been BANDWAGON fans. Not an attack when its the truth. I don't have to say anything about the team we have owned the best they have ever had. Uh how is your statement pictured below any different? Still don’t understand why I refer to you as the king of contradiction??? I can live with the 6 championships in 18 yrs compared to 1 for your doncos. Can you live with that. The fact that Tammy is 8-9 all time against denver 1-3 in the playoffs & wait for it....0-2 in AFC Championship games which would essentially be a super bowl for as far as each team can meet with each other. Now smart guy, do you care to tell everyone why it is that those records are such? tell is all why the all mighty tammy brady has such a record in the biggest possible game these two teams can play each other...please do tell. Next up is how cute the reference is to super bowls & how you want to only go back 18 years, hmm why would this be?? could it be because that is when chowder was invented? nah that can't be it, so what gives? wait i think i got it figured out...yes that is when football started, it all makes sense now. I just can't understand something then if that is when football started...how would the broncos have 3 super bowls but yet you say 1? Oh that's right, it just wouldn't fit your narrative now would it? nah we couldn't go back just 3 more years because 3 titles in 21 years just isn't the same as 1 in 18 now is it guy? Last edited by BroncosFanInPA; 02-11-2019 at 07:56 PM. You make zero sense. Why bring up something from another thread when one doesn’t have anything to do with the other? Wrong. I never called Broncos fans bandwagoners in the other thread, which is what Assassin whatever-his-name accused us of being in this thread. Last edited by TommyBrady12; 02-12-2019 at 08:21 AM. Wrong. I never called Broncos fans bandwagoners in the other thread. Is that the only way to attack fan bases?? Now, there are TONS of Pats bandwagon fans. You can't say differently unless you truly didn't follow prior to 2001. The Pats were one of the lowly teams in the NFL and had no following. If you believe differently, you're blind. Funny thing, I know some here in Kansas. I asked them how that even works and one of them admitted that they only started following them in 2001. They were Cowboy fans prior to that. I know every fan base has them but there's a lot more following the Pats than others. Now, before you say anything about me being in Kansas and a Bronco fan, I'm not a Kansan. I'm from Colorado and been a fan since I was able to understand the game. I was not attacking the Broncos fan base. 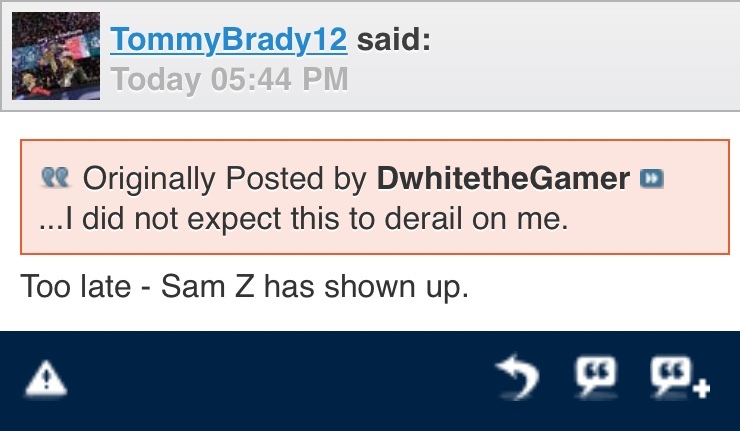 I was going after Sam Z for being a thread-wrecker. Can there be any doubt that he is? Yes, there are a ton of Pats bandwagon fans, perhaps moreso than the Cowboys, 49ers, etc. The reason for this disparity is because the Pats have won more. But these bandwagoners will disappear in a few years. I’m not worried. I made that statement only because I have seen it first hand. I was born in Mass. and moved to N.H. as a young kid. I have lived in New England all my life. I have seen with my own eyes how the Pats fans works. I know it bothers you TB12 but I am only speaking on what I have seen first hand. I'm not accusing...im speaking the truth.